I suppose this must be happening with millions around and if that's the case, I would love to hear your stories too! Since we have just moved to a new place, getting adapted to the ways of our new house, the location and the people around is surely a task. And, we are obviously depending on a lot of people around us to help enhance our knowledge on things we never paid heed to before. Moving on, living in the old house for about two decades, which is like my entire life, I still miss nothing that substantial about it. I know this might sound weird, but I am so mesmerized by my new abode, that zilch seems to fade in front of the old house’s beauty, except for the intangible part, i.e., the memories! Moreover, here, we have found one more thing, or rather, a person, who has made us, my entire family, kind of used to it. Our NEW MAID. 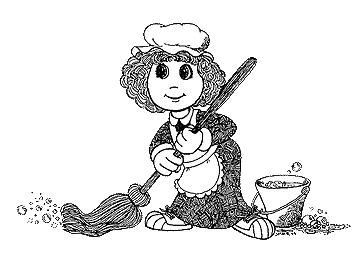 Well, I never thought, being in my old home, that I would ever dedicate an entire blog to my maid, but that’s how life is. It can treat you with nicest of surprises in weirdest of forms! You would be thinking what about a maid, what extra can any maid do, how can one get used to a maid, etc. I’ll tell you more. This maid, a very cutesy Nepali woman, is not new to Delhi at all. She’s been living here for more than a decade. Her wrinkles have a lot to tell about the world she has conceptualized and her very innocent conceptions might very easily keep one glued to her for hours. Always giving her 100 percent to the work, to the surprise of my almost every other relative, she would be the first to run for help, when any one in the family commands that. I could easily dedicate my entire post to her life story which is equally enigmatic, yet so so clear! For this, I might have to know her more and till then, I would wait to hear from my readers. I have all the reasons on Earth for calling her that! Excellent penning, now ,maid , is something to envy. Thanks for your comment, Pramod! Do keep visiting.